Do You Have Personal Stories Witnessing This Abuse? Please Post Them In The Comments Below! Sugar’s Story is sadly just one of many. There are thousands of “Sugar’s” and hogs that are unnecessarily suffering inhuman treatment due to exemptions in most current state laws. If you have a personal account of witnessing this abuse, we strongly encourage you to share here. Your personal account will help us build a case for new legislation to protect both species from abuse. We require that you leave your email (to establish credibility with the lawmakers,) but it will not be publicly published. However, names are automatically added to the comments. If you feel more comfortable not using your full name or an alias, feel free to do so. The supporters at Sugar’s Hope, thank you in advance! Blood “Sport” Packaged as Family Entertainment? If you’re like most parents planning a weekend outing for your family, you might take your children camping, to an amusement park, or a baseball game. Not so for many parents in rural Louisiana. Or Alabama, Mississippi, Texas, Florida, and a handful of other states where feral pigs roam. A weekend highlight for some families in these areas is the so-called “hog dog rodeo.” If you miss the homemade tin signs—”Hog Dog Rodeo Tonight! Turn here”—posted on trees along dirt roads, you can still find one of these events. Just listen for the squeals of terror and pain from the pigs and cheers from the audience of parents and children. Hog dogging, hawg dawgin’, hog baiting, hog dog “rodeos”: They’re all terms for a bloodsport known as hog dog fighting. An owner leads his trained pit bull into an enclosed pen. She lunges and pulls so hard on the leash that she soon stands erect on her hind legs, her face fixed in a snarl. Her guttural growl erases any doubt that she is unsure of her purpose. At the other end of the ring, the “handler” shoves a feral pig, or hog, through a chute into the pen. He will use a cattle prod if the hog, who has faced these dogs before, hesitates. And just in case the hog had any notion of trying to defend himself, the handler has already taken the precaution of removing his tusks with bolt cutters. The pit bull’s owner removes her leash. Before you can count to three-one-thousand, the dog tackles the hog in a cloud of dust. Her jaws tear into the hog’s flesh, maybe ripping his snout, tail, or an ear. The hog expresses his pain and fear through loud squeals that echo off the pen’s tin walls. The crowd is pleased; the dog pins the hog to the ground in a mere seven seconds. As with a wrestling pin, the mandatory three seconds elapse, and the operator declares the dog victorious. Adults and children cheer for the fast, powerful dog. However, the dog’s jaws remain attached to the hog’s flesh. After what must seem like an eternity to the hog, people casually make their way over to end the match. If the hog struggles, the handler may give him a sharp boot to the head, then dig his heel into the hog’s chest to still him. He then uses a long, wooden blade called a breakstick to pry the dog’s jaws from the hog. It can take up to a minute to release the dog’s grip while the hog continues to writhe in agony and terror. After the proud owner leads his dog away, the handler may pour apple vinegar into the hog’s wounds. The vinegar supposedly helps the wounds develop scabs so that the hog can be mauled again in a few days. If enough children attend the hog dog fight, the operator will encourage a game of “catch the pig.” In this “kiddie-friendly” game, the handler tapes the hog’s snout closed and encourages children to chase the terrified animal around the pen. At one event, secretly videotaped by Alabama’s NBC-15 station, the announcer remarked that the hog suffered a broken leg, something that failed to dissuade the children from trying to tackle the pathetic, hobbled animal. At the end of the night, the organizer tallies his profits from admission and dog entry fees. And the owners with the fastest dogs leave with trophies and hundreds of dollars in prize money. Hog dog fights are not new; they’ve likely been around for more than 25 years. 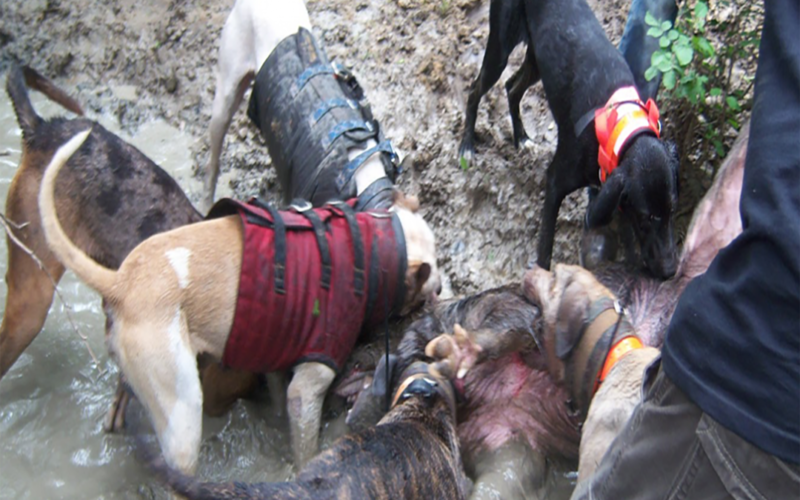 The HSUS believes that hog dog fights regularly occur in at least ten states: Alabama, Arizona, Arkansas, Florida, Georgia, Louisiana, Mississippi, Oklahoma, South Carolina, and Texas. Hog dog fighting stems from hog hunting, a still-legal pastime in which hunters use dogs to find, chase, corner, and sometimes catch the hogs. Because feral hogs are considered a nuisance in rural areas, locals still take pleasure in “taking down” a hog. Farmers charge that hogs trample native plants, create competition among other wildlife for food, and invade farmers’ crops. In many states, there are no limits on hunting, and hogs may be killed at any time of year, by any means. When hunting feral hogs, dogs fall generally into two camps: “bay” dogs who only corner the hog, and “catch” dogs who actually clamp onto the feral hogs with their jaws. The latter dogs present a danger not only to the hog, but also to themselves, since the hog still has his powerful tusks. Traditional hog hunting first spurred “trials” in which dogs competed against each other to catch and corner hogs. Uncle Earl’s Hog Dog Trials in Winnfield, Louisiana, has been an annual event since 1995, and is now billed as the “Super Bowl of Hog Dog Baying.” There are even youth scholarships for the event. While hog dog trials try to package themselves as respectable entertainment, they are often little more than glorified hog dog fights, similar to other bloodsports like dogfighting, bullfighting, and cockfighting. “It’s just another form of staged animal fighting that belongs in the same category as dogfighting and cockfighting, both of which are illegal in most of these states,” she adds. After attending large events in nearby cities, excited hog dog fight fans may return home and decide to start their own local event. The new enthusiast will use small cages to catch wild hogs, whose tusks will be promptly removed with the ever-handy bolt cutters. All it takes is a trained dog, a hog and word-of-mouth promotion, and news of an upcoming hog dog fight spreads like kudzu. When enough local interest forms—and it always does—the organizer sets a date and time. He will charge about six dollars per adult and let kids under 10 enter for free, making the attendance of children tempting for families trying to stretch their entertainment dollars. 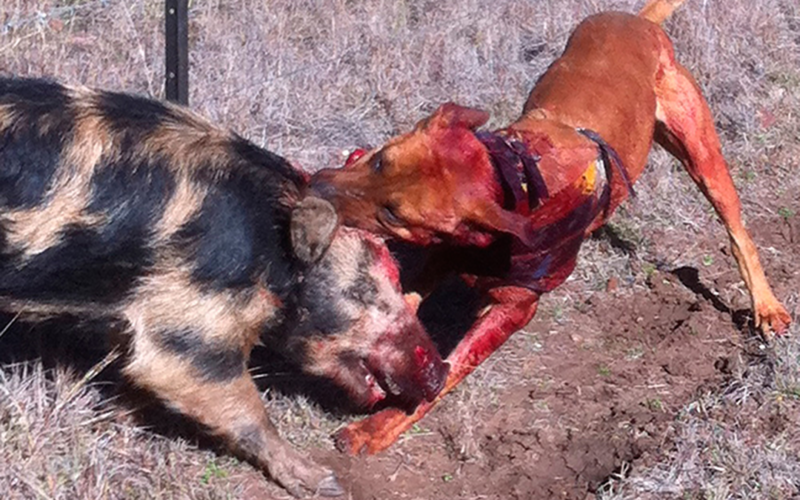 Hog dog fights have historically remained just under the radar, but that is changing. 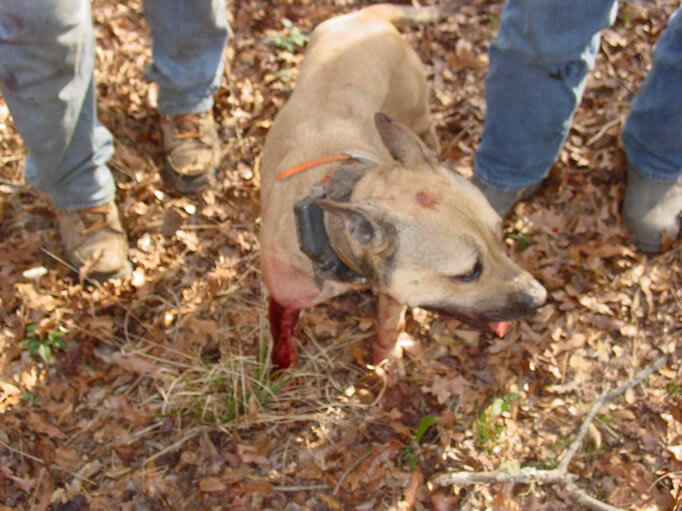 In between those two arrests, Louisiana Rep. Warren Triche introduced a bill to ban hog dog fighting in the Sportman’s Paradise (excluding hog hunting), which passed and went into effect in August 2004. Animal welfare advocates around the state united in support of the law (even if hog dog fans have also tried to reverse it). Alabama recently tried to move a step closer to making Winters’ wish come true. State Representative Thomas Jackson introduced a bill in the 2005 session that would ban organizing or conducting a hog dog fight, training an animal for such an activity, and even purchasing a ticket to a hog dog event. Legislators in Tennessee introduced a bill that added hogs to the list of animals that are illegal to train or use for fighting. Neither bill passed this year, but the issue is expected to be revisited in both states next year. For now, no other states have introduced bills to ban hog dog fighting. But those states may be lying low for good reason. 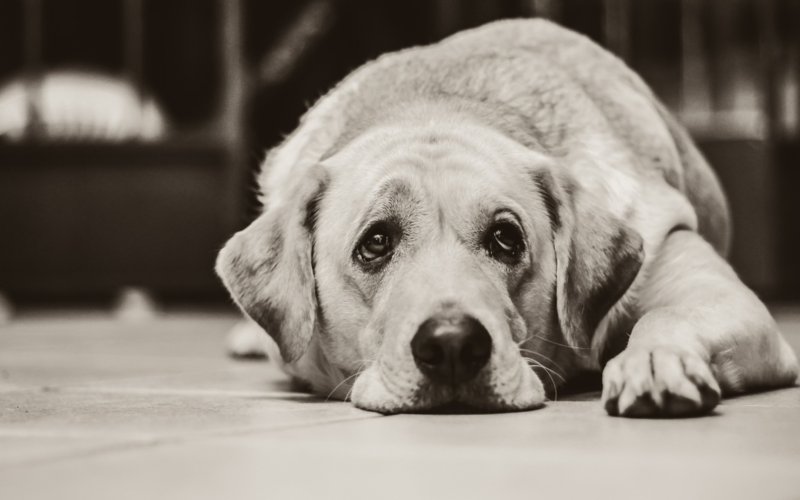 The HSUS believes that the bloodsport is already illegal under many states’ existing animal cruelty laws, and two recent rulings have confirmed this: The attorneys general in Texas and Florida have delivered opinions stating that hog dog fights violate their cruelty laws. Mississippi, like Alabama before it, will be the next state to test that theory. Frankie Wheat was arrested on misdemeanor animal cruelty charges in June 2004 in connection with operating a hog dog fight. He will stand trial some time in 2005.